My impression is that future generations will look back on this moment and say “this is where they completely lost their minds”. This statement was written a couple of weeks ago by a well-known market analyst and academic, John Hussman. He could have been referring to many markets over recent history. For example: the final market peak saw negative interest rates in many countries and governments and corporates being paid to borrow money from willing investors. They were desperate to lock-in a negative return in many bond markets. If that isn’t the height of financial insanity, I don’t know what is. We also have cryptocurrencies or ‘token money’ that in 2017 has seen an epic increase in its market capitalisation, prompting comparisons with the historic Tulipmania bubble almost four centuries ago. Hussman was in fact writing about the stock market and the record historic valuations in late January. The fact that in 2017 the S&P 500 index recorded price increases in every month, for the first time in almost 100 years of trading, went largely unnoticed by the masses. The chart and headline above typifies the raging bullishness – despite the worrying reference to 1987. It always annoys me to read stories like these, where to many, it sounds like there is just a huge wave of buying, propelling the market to new and sustainable higher levels. But, for every buyer of $100 billion worth of equities, we have to have an equal and opposite seller. Who was the seller in January at record highs? When the dust has settled, I think we will find out the seller was the longest equity holder of all: the pension fund industry. 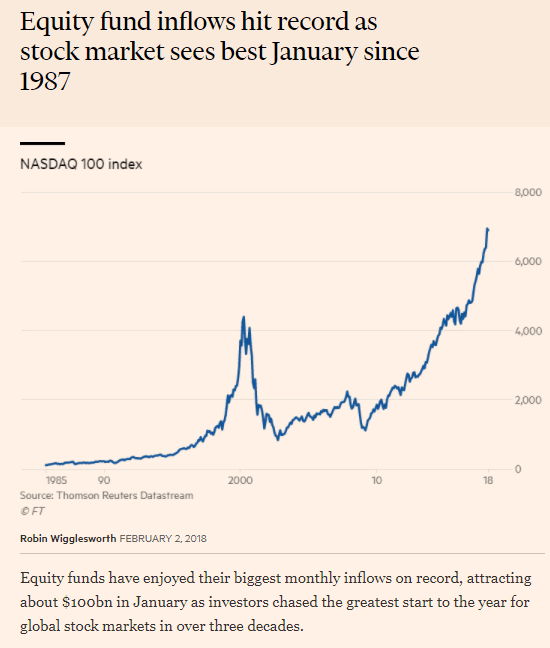 Why do we not see headlines saying “Record sales of $100 billion of equities by long-term pension funds transferring their equity holdings to short-term retail investors at record high prices”? Do people not understand the concept, that asset classes have to be owned by someone at all times, and transfers just occur at different price levels, depending on investors’ agreement for a millisecond in time? Or is it still generally frowned upon to write negative headlines about stocks and the economy? Unfortunately, for the January retail investor into equity funds, the timing hasn’t been the best. In little over a week in February, many stock markets suffered up to 15% declines, with the Dow Jones posting a record 1175 point loss on Monday 5th February. However, such a decline was ‘only’ a 4.6% slide; a long way off the 22.61% daily loss seen in October 1987. Investors might feel safe…for now. We should not be surprised at this sudden spike in volatility, it is long overdue. The only surprise should be that it has taken so long, and we should expect more and more in the future, despite the widespread belief that you always have to buy into dips for the long-term. Since 2008, there has been the most aggressive monetary injection in history. Arguably, though, it started as long ago as 1995 when central banks, led by US Federal Reserve chairman Alan Greenspan, felt the need to oversupply economies with unnecessarily cheap money “to maintain growth” at any price. 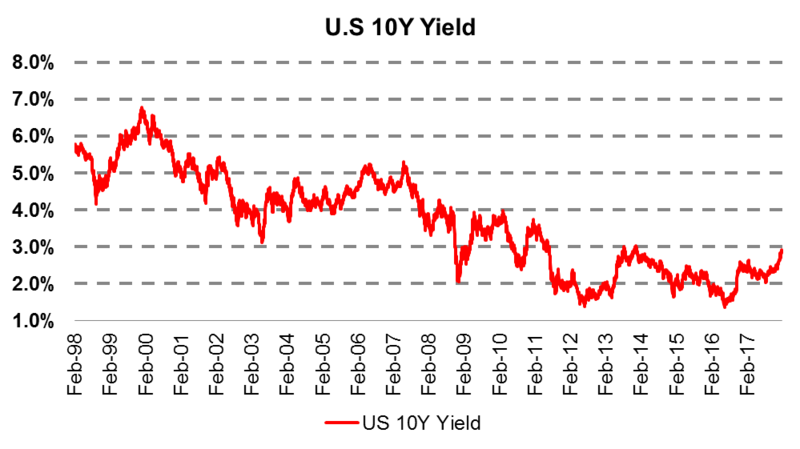 This created two bursting bubbles: in 2000 and 2007. We will now see the biggest bubble of them all in 2018. 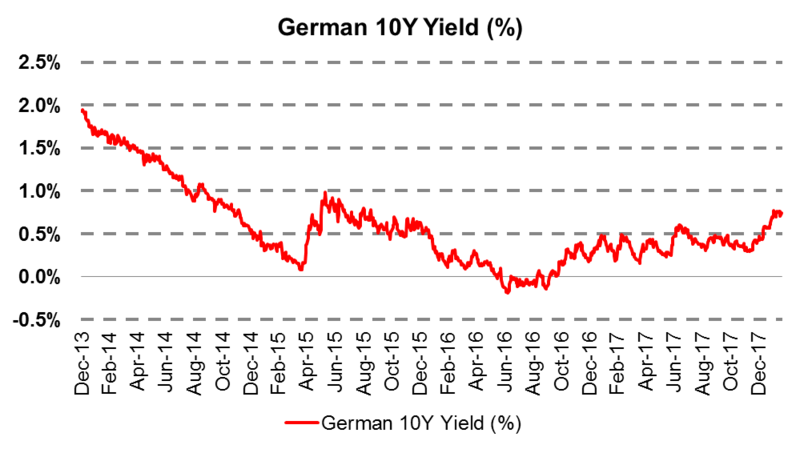 Strong economic growth saw bond yields rise, and that growth is no doubt partly behind the belief in equity price increases. 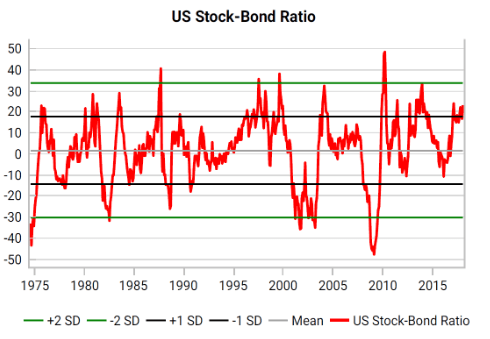 Unfortunately, this ratio between stocks and bonds has become very stretched, giving every reason for the pension funds to feel the need to rebalance their allocations, aggressively favouring equity sales and bond buying. Obviously, this transfer of equity holdings, at record high valuations, from strong hands to much weaker hands is not a good sign. Last month’s volatility spike saw the much traded VIX Index skyrocket higher. The short-Vol trade, as it is known, has been one of the most profitable trades for many hedge funds over the last few years. In effect, it is selling “nothing bad happens” insurance and pocketing the premium every month. It was such a great trade that many investment banks created synthetic products that matched the performance, mainly ETNs (exchange traded notes) or ETFs (exchange traded funds) that could be invested in by smaller investors. 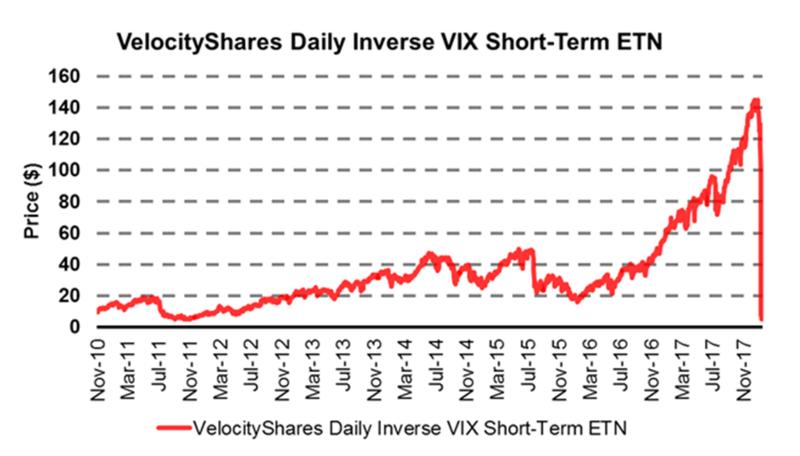 The chart below is just one such product, the VelocityShares daily inverse VIX, run by Credit Suisse. Despite having $2 billion in assets in late January, by close of business on Feb 6th, it had fallen 93% and saw the product close, with investors left with a meagre 7% of their savings. Up to 20 other similar products were also being terminated by the sponsors. Not ideal. In the world of investment, people want to make money, naturally. “Income or growth” is a well-known mantra from many Independent Financial Advisors touting for your business. “A bit of both, balanced” is the typical outlook. Fortunately, most investors tend to not head straight for complex ETF products that go down 90% but stick with property, bonds, equities and cash. The problems start to arise when cash deposits and bonds have very low interest rates and “aren’t being put to work” while other investments are going higher. Then, cash becomes a financial hot potato, and investors rush to not have any in their portfolios, swapping it for better returns elsewhere, hopefully. FOMO, ‘The fear of missing out’ is a well-established human trait. Unfortunately, valuations, like gravity, tend to see excess speculation by the masses fall to earth at times. FOMO quickly evolves into fear of not booking profits, then fear of not being able to break even, leading sharply to fear of losing money, then to fear of losing all your money. Cash, goes from financial hot potato, to a much-desired asset in short order. Kenny Rogers reminded us, “not to count your money while you are sitting at the table” when bitcoin was at $20,000 and cryptocurrencies were on a tear. Any investors who got out with huge gains were matched inversely by the losses for others – as is the norm in the zero-sum world of trading. Most of the token money has seen some serious price declines. While it is my belief that most are destined for close to zero values in years to come, there will be some very tradeable bounces before then. I have tried very hard to have balanced views about cryptocurrencies, not to be too cynical or sceptical and to look at the good with the bad. But, after I signed up to the ICO (Initial Coin Offering) Alert emails my mind was made up. Cryptos can be mass produced. There are currently over 1400 in existence, with new ones issued each week. They are being mass produced by lines of code, vague business plans, and “new, usually young, experts” all over the world. You just need a ‘White Paper’, a discount incentive on tokens in the initial sale, a reference to your use of blockchain technology and you are away. We have 180 REAL currencies in the world already, doing REAL trade. In fact, 90% of world trade goes through less than five currencies. It is not obvious to me at all why we need to convert those real currencies into tokens to facilitate trade or payment transactions and we certainly don’t need 2000 of them. Blockchain is a technological advancement, similar to the RSA algorithm of the 1990s, which enabled us to ‘encrypt’ websites and emails. There are over 1800 patents for blockchain technology; no-one is going to be the outright winner here apart from the consumer. Within a few years, it will be accepted, taken for granted and forgotten. The ability to secure historic computer data is a welcome step, but it is not the holy grail of anything. Banks and governments, which have been slow to react or regulate will quickly do both. In time, I presume they will still control all the money and the payment world, but they will use blockchain technology. It is often a lonely place, warning about potential disasters in markets. If you are too early, you look rather foolish as the world continues to gain in wealth and you are viewed with scepticism. If you are correct and timely in your analysis, people who lose half their money regard you as a smug doom merchant revelling in other people’s misfortunes. They might use the infamous German word, ‘Schadenfreude’. In my own analysis, I tend not to believe ‘this time is different’. From a probability stand point, economies that have been pumped up on monetary steroids are liable to see rising inflation at some juncture, leading to potentially aggressive inflation. Interest rates are very unlikely to remain close to zero with or without that event based on 5000 years of historical precedent. Stock prices are very, very unlikely to remain at the most overvalued levels in 100 years, whether interest rates rise significantly or not. Token money or cryptocurrencies that can be issued every week may have an intrinsic value much closer to zero than current prices. Let’s not be surprised if probability plays its part and cash in the hand is worth something again.